This my great-great-grandfather, abortion Simon Podwal. 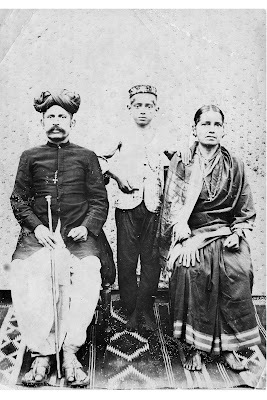 The Catholics of Mangalore, a coastal town north of Goa, voluntarily converted to Christianity in the 1600s under the influence of the Portuguese. Many of these early settlers had fled the horrific, forced conversions going on in Goa, that were a part of the Inquisition. Below is Simon's son, Andrew D'sa, my great-grandfather and his first wife and daughter. Now we have Appolinaris D'sa, my grandfather, whom I lived with as a child and loved very much. 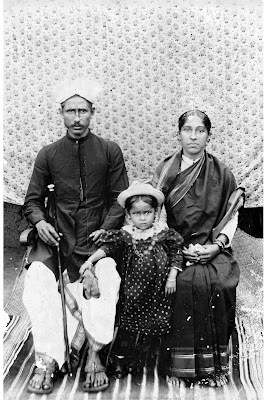 This picture was taken in 1938 in Mangalore. He is a young lawyer 2 years before he is to meet and marry my grandmother, Eunice Pinto. Switching sides, below is a picture of Rose Pinto, my great-grandmother. She was born in 1896 and died at the young age of 24, in 1920, of Typhoid, a terrible disease at the time that claimed the lives of young mothers and children every year. She left behind 3 children, the oldest of which was my grandmother, who was 7 years old when her mother died. And here is my grandmother, Eunice D'sa, the year she married my grandfather, in 1940. The picture is a cropped image from a group photo of the Ladies Club of Mangalore taken in honor of a visit by the British Governor's wife. This is 7 years before India's independence. And finally my parents, Marina D'sa and Paul Subaiya in 1972. Marina was Eunice's 4th child.